Summer in Kansas. It isn't my favorite time of year, not by a long shot. I become a lethargic, whiny baby in sticky hot weather. This summer, much like last year's, hasn't been so bad. July was one of the mildest on record. However, it is now late August, and I am over it. One of my favorite lines from one of my favorite Maria McKee songs is "She don't sweat, she sours and melts like ice cream in the sun." That's me. I am rancid, runny ice cream. So I park myself next to a fan and I read. And if I can read about cold weather in some faraway place, well... that's even better, right? Ophelia and the Marvelous Boy is a lovely book, with illustrations by Yoko Tanaka. 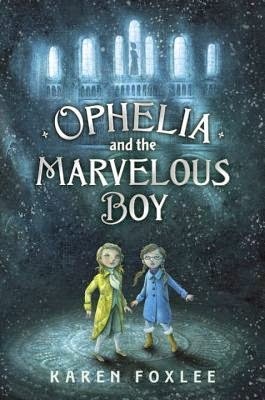 A girl named Ophelia goes with her older sister, Alice, and their father to stay in a very snowy town over Christmas break. The girls' mother died three months ago, and the three are grieving in their own ways. The father is an expert on swords, and is hired by a stately museum to help prepare a grand exhibit for Christmas Eve. Alice, who promised her mother to help look after Ophelia, is depressed and lethargic, uninterested in everything around her. One day, Ophelia comes across a painting, "The Marvelous Boy." A door is next to the artwork. Not quite knowing why she does it, Ophelia peers through the keyhole. An eye is looking back at her. The owner of the eye claims to be the boy in the painting, and boy without a name, who needs Ophelia's help to locate a sword and "The Other One," the person who can wield the sword to help the boy defeat the evil Snow Queen. Ophelia is a practical, scientifically-minded girl, who does not believe in magic or in things that cannot be proven. Her mother, however, was a famous horror writer, who loved stories about ghosts and castles and vampires. Ophelia finds herself on a quest, the voice of her mother whispering in her ear, helping her along. Ophelia is sent on various errands, running into obstacles she cannot explain. Her father is preoccupied with his work, and the director of the museum, the icy Miss Kaminski, frightens her, even as she takes a special interest in the grief-stricken Alice. I could have waited until October and my month-long Halloween celebration to share this book. Mysterious, ominous clocks, ghost girls, frightening animals, mysteriously changing rooms... It has just the right amount of thrills for a kids' book. And as the Wintertide Clock counts down to Christmas Eve, I suppose I could have waited until December. But this book is too good. I needed to share it now. I've told the girls about it, and they have placed it on our read-aloud list, but it may take us a bit to get to it. For more, you can read the review from the New York Times Sunday Book Review. I think her assessment gels with mine. The book seems familiar at times, using common fairy tale and kid-lit devices, and it isn't perfect, but the whole product makes it a very worthy read. Random House Kids has set up a nice subsite, with excerpts from the book. I think I may have to check out more books by Karen Foxlee soon. Oooo sounds like I better get it. Wow that's really an interesting book!!! I want to read it now! I really did like it. I read it in just a couple of hours. I'm ready for Fall too, thinking of dark, halloweeny tales and cold weather and witches. I love all four seasons at their time, but now that summer's almost over, I'm getting excited for a change! So yay for fall! I LOVE your description of how you feel in the summer heat. I am pretty sure I feel that way here in the hot Atlanta weather. This does look like a great book. Maybe a good Christmas present for Miss M.
There were two things I appreciated about Georgia in the summer: 1) the little bit of rain that seemed to come every afternoon, and 2) TREES. :) I'm excited to see how my girls enjoy the book. I'll be taking a break from Oz in October, so we can read "scary" books (but not really SCARY). This one will be on my list!